While the current bobstay chainplate is fine and free from any weakness after 17 years, I came across a beautiful bobstay chainplate from Spartan Marine. Spartan, the original hardware foundry for Cape Dory, makes beautiful bronze fittings. The new chainplate is what they call burnished bronze, with a working strength of 10,000 pounds--meaning I could lift the Bristol with it. It comes with the mounting hardware and backing plate you see in the photo. It is model C-183; about $94. The backing place is aluminum and the mounting bolts are 5/16" stainless so I will use a stainless backing plate instead and bronze bolts and nuts to head off any galvanic reaction between the dissimilar metal. I will have to fill the holes in the bow from the old chainplate, build up a new backing plate of teak glassed into the bow, and drill new holes, but all that can wait until after I paint the topsides. For now it will go in the box with all the rest of the bowsprit hardware. To be safe I plan to check all the standing rigging using Magnaflux spray. 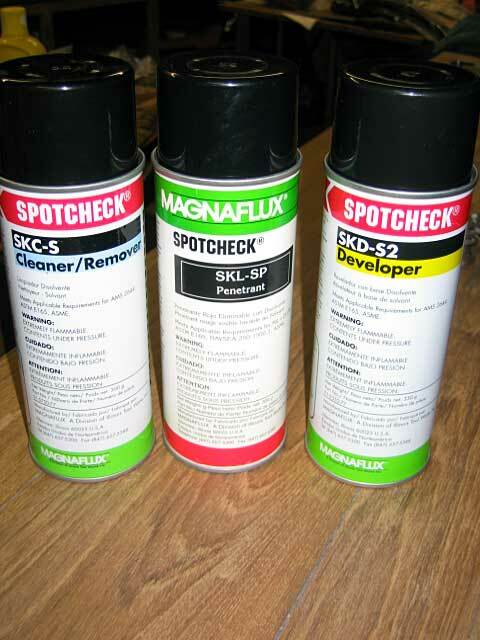 Magnaflux provides three cans: the cleaner used to clean the part before checking and clean off the dye after checking; the penetrant, called SpotCheck; and the developer. I an very curious to see if there are any hidden flaws in my rigging. 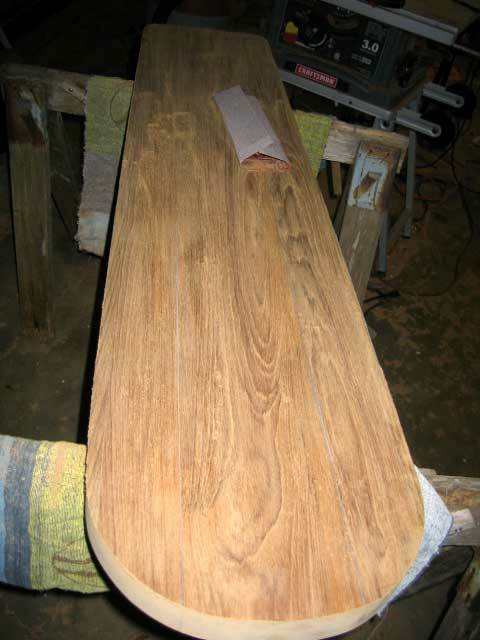 I finished all of the final shaping of the teak today and got it sanded down to 150 grade. I really wish I had a 14-inch band saw to shape the piece, but all I had was an anemic jig saw and my trusty belt sander. I used the belt sander (I've hot glued a level bubble to the top so I can be fairly accurate with it if I'm careful). 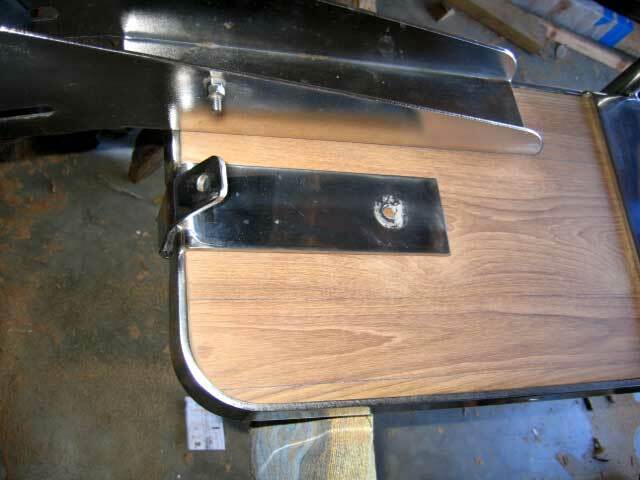 The curve you see here at the inboard edge of the sprit was made with the lid of an old cook pot I have in the garage, I figure a rounded end like this is as ship shape as anything else I could come up with. 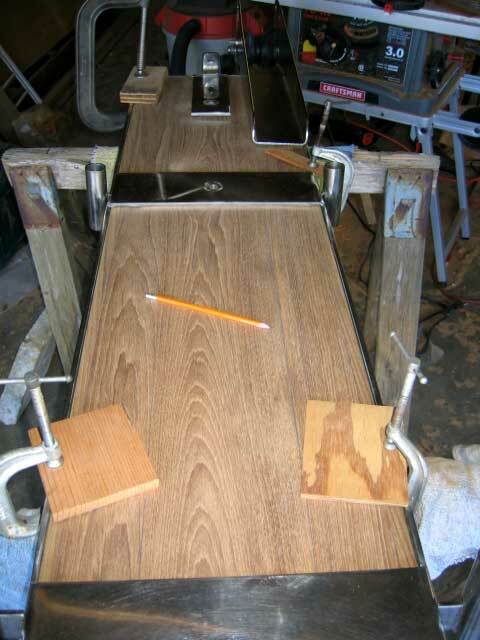 I rough cut about a quarter inch outside the pencil line using a skill saw, Then I finished using the belt sander. The final step to finish this edge was bullnose it. Somewhere in the garage I have a router, but I couldn't find it today, so I marked out a relief with a pencil about 1/3" in from the top and in from the facing edge. Then I used the belt sander to carefully take off the wood just to the marks. I smoothed everything out with some 150 grade sandpaper and called it quits for the day. It came out pretty nice and will look even better finished. I've decided to overbore the mounting holes and fill them with epoxy as a further protective effort. 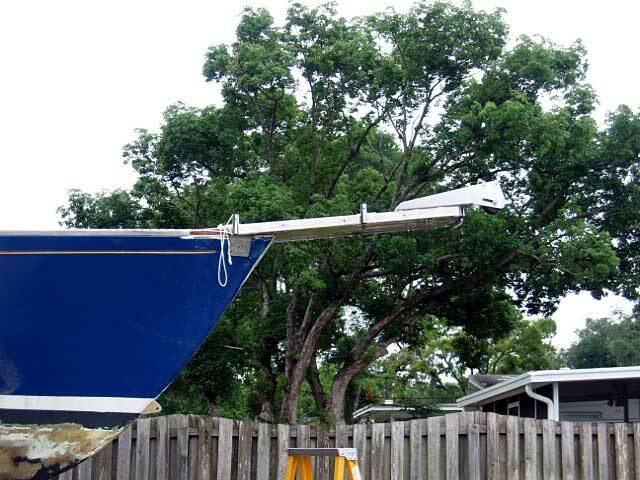 It's probably overkill but hey, this is my 50 year bowsprit, remember? I start by mounting the teak in the surround, getting it centered and positioned as it will be when it's permanently mounted on the boat. 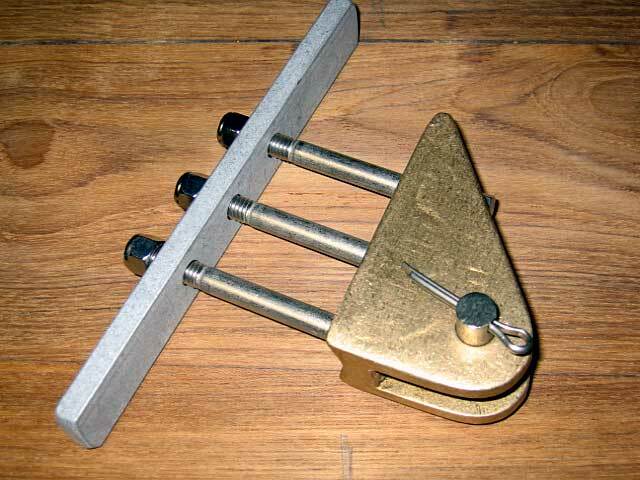 Next, I clamp it in place to ensure nothing moves. 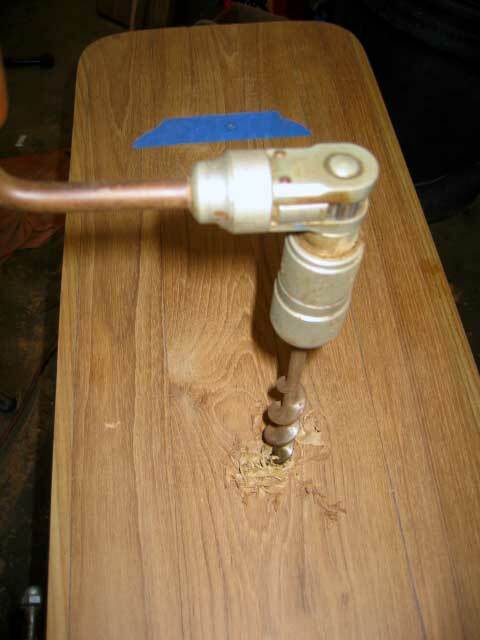 The clamps force the teak up against the mounting cross members of the surround exactly as it will be when the mounting bolts are tightened down. Shaped carefully with my little belt sander, the teak fits about as perfectly as I can get it. When everything is adjusted the way I want it, I mark the mounting holes: one at the forward edge, one in the middle cross member and one at the aft cross member. Now to find the exact center of the penciled circle. The holes are 1/2" so I get a half inch bit and turn it in each hole to make an indent, marking the exact center. 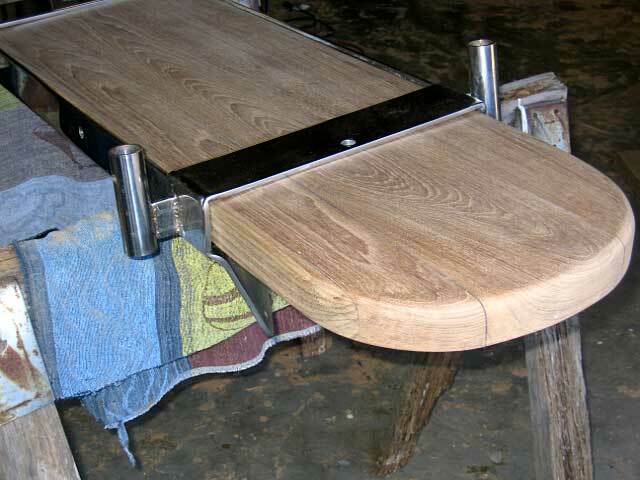 Then I remove the teak from the surround, clamp it up and use a hand brace with a 7/8" bit to bore each of the holes. The holes will be filled with epoxy and later redrilled at 1/2" through solid epoxy. Finally, I tape over the underside of the holes and mix up a 4-pump batch of epoxy. I add enough 405 thickener to it to give it strength but still let it pour. 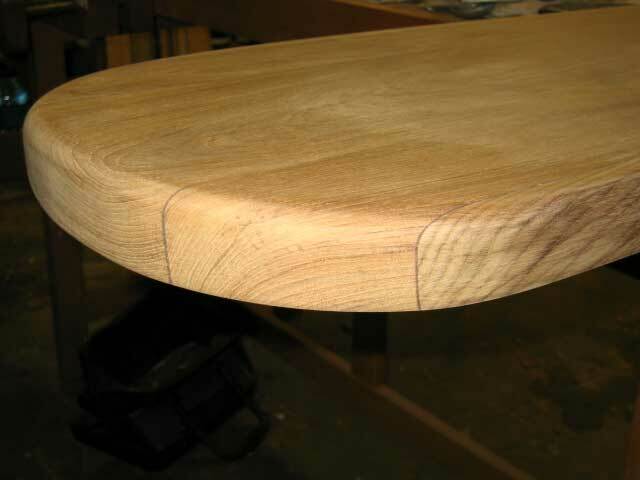 I fill up each of the holes and add a dribble to the top to round them above the level of the teak board. 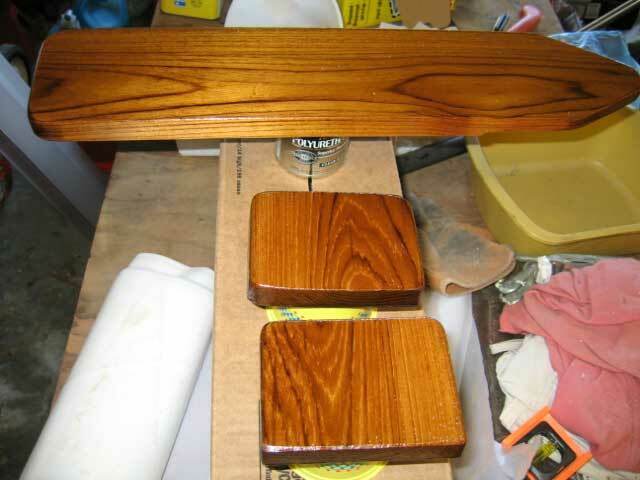 Tomorrow I'll sand them down flat and smooth and re-mark the teak for the 1/2" mounting holes. Cold weather has kept me out of the garage and off the boat the entire week, so today I started early, concentrating on the bow where the new sprit will bolt down. 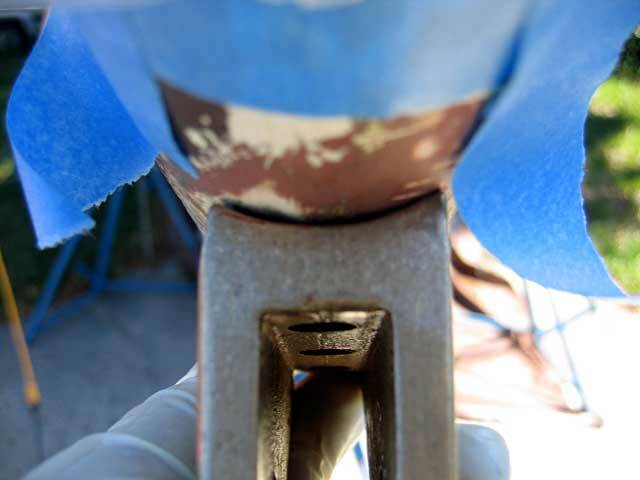 This is what your foredeck looks like under that lovely bronze stemhead fitting. That's the hull to deck joint smiling at you. 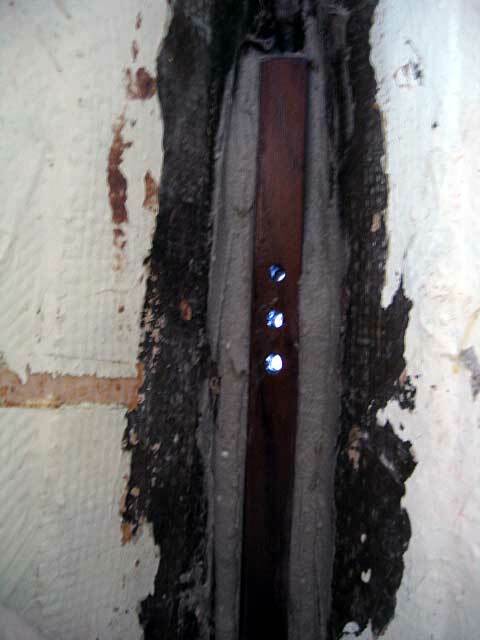 The gap was filled with the mastic Bristol uses to seal the joint. The good news is it's still sticky and pliable. The bad news is the screw heads were not all that tight. I horsed them down, dug out all the mastic and cleaned everything up with acetone. Then, I mixed up a batch of thickened epoxy and leveled everything out as much as I could. 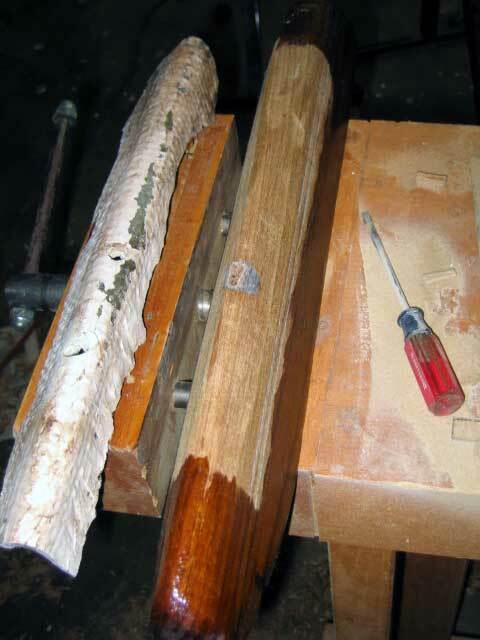 It will take a few coats to fair everything even and smooth. 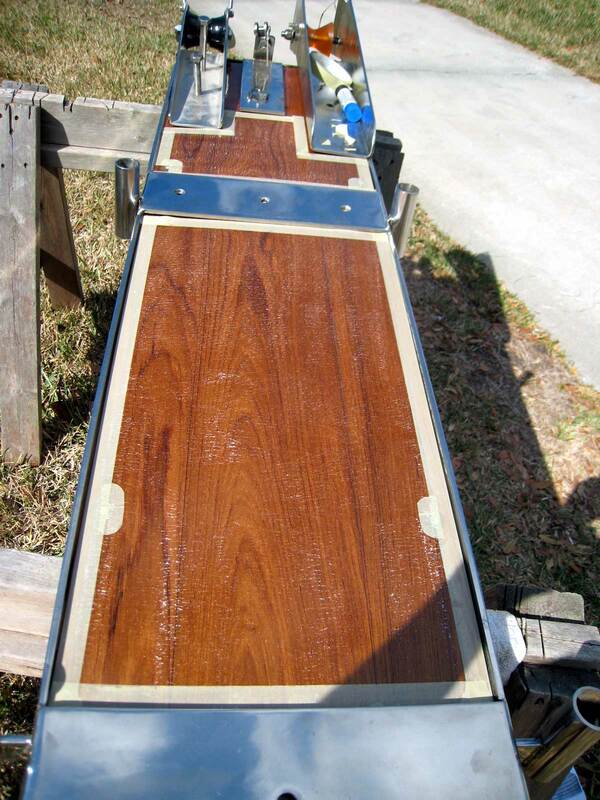 While the epoxy was drying, I took some 1" thick teak and shaped new backing plates for the sprit. The old backing plate is dry and no rot is evident, even though one bolt hole leaked enough to rust a fender washer. All told not too bad for 17 years of use. When I install them I will butter up the under side with about a 1" thick layer of thickened epoxy and brace them into position until the glue hardens. The new teak backing plates will last a good deal longer than that ugly piece of plywood and dress up the forepeak as well. After sanding I applied the first of two coats of epoxy. I had enough left to start on the bottom of the sprit and I mixed a bit more and got the whole underside coated with a first layer. Tomorrow I will flip it over and do the topside, as well as start leveling the foredeck. Today I worked mostly on the foredeck, leveling it, filling gaps and irregularities. The deck is crowned of course so to ensure the sprit lays flat on it and is supported equally in all areas, need to build up the edges about 1/4" and taper the build in toward the centerline. With the first bowsprit I was careless about this, filling the gap on each side with caulking and now worrying about it. This time I want as much of the deck as possible to squarely support the sprit. Using my little belt sander with 80 grade paper, I sanded everything as flat and even as I could. 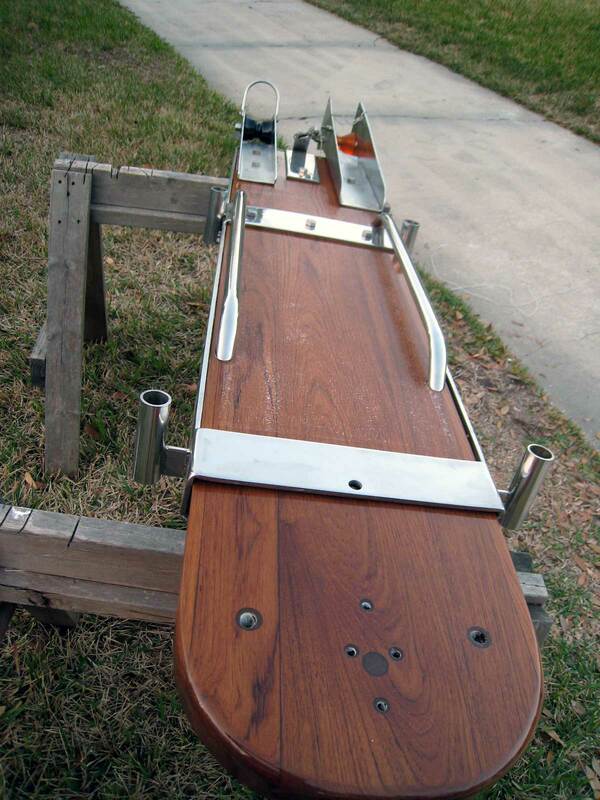 I used a nice square piece of 1" mahogany to lay down as if it were the bowsprit and I sighted under it. 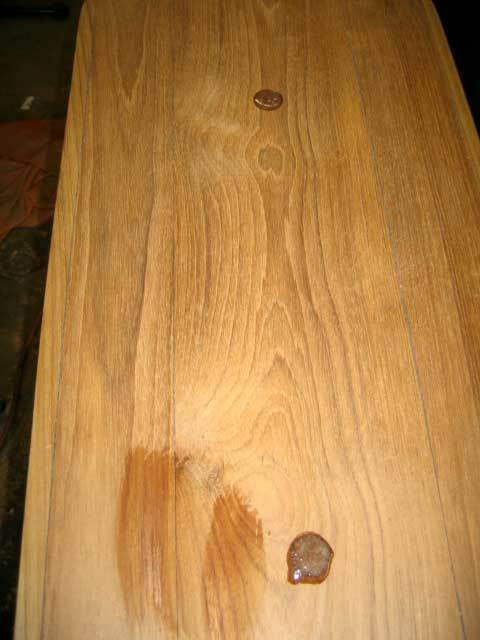 I sanded a little, checked with my plank; and sanded some more, being careful to keep everything level and square. 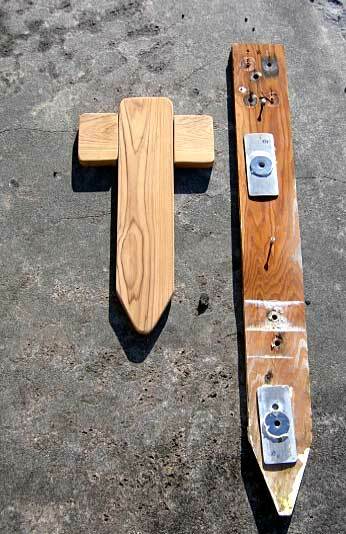 Finally, the plank rested square and true, and all that remained was to build the turn of the hull a little. For that I laid the plank down as if it were the sprit and carefully taped along the topside, with the upper edge of the tape just touching the bottom of the plank. Then I mixed up a batch of epoxy, thickened just short of the consistency of peanut butter, so that it would level itself but not run. I gently ladled this along the edge of the tape a little high, and then carefully leveled it using a plastic squeegee. Once one side was done I waited for it to harden and later this afternoon, did the other side. Before calling it quits for the day I wet sanded the bottom of the bowsprit and laid on a second coat of epoxy. It's looking very nice. 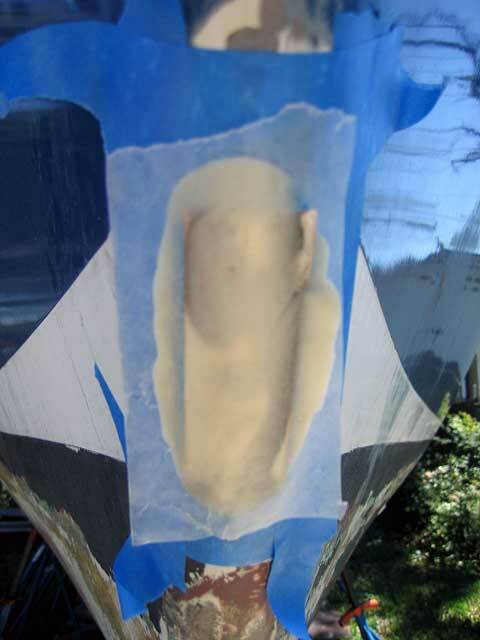 Today I leveled another coat of thickened epoxy to the foredeck, sanded it smooth and layered on another thin level. The bow is just about as even and smooth in its eventual support of the bowsprit as I can get it. I received a quart of System Three's WR-155 water based epoxy primer from Jamestown Distributors today. I've never used this product but thought to try it out on the bow after I finish leveling it. I'll let you know the results. 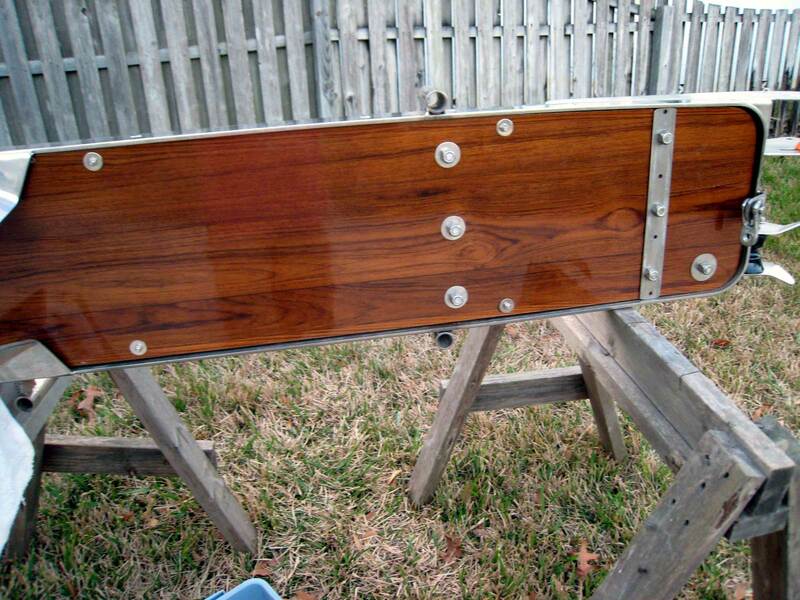 Then, I drilled the holes on the sides of the bowsprit for the 6 2-1/2" #14 stainless wood screws that secure the sides of the stainless surround to the teak bowsprit. I used a portable drill press attachment to keep me square to the edge. There are three screws to each side. I drilled them all. 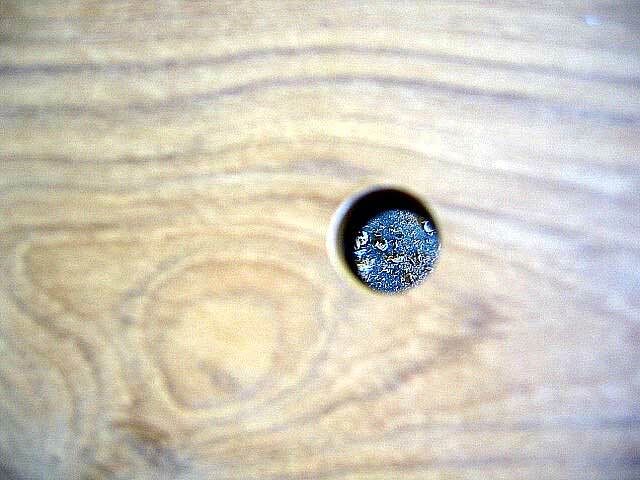 Then soaked the holes in heated, thinned epoxy and ran the cooking oil-coated screws down into the holes. The epoxy hardened, creating permanent tapped holes for the wood screws that will be impervious to water or rot (again, the 50-year theory). 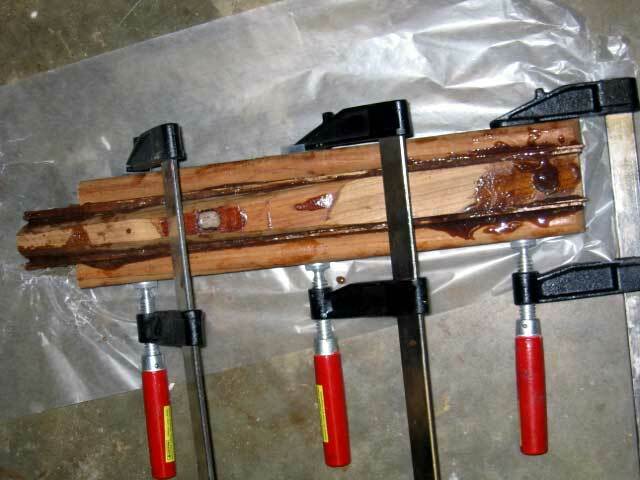 All that is left to finish up the bowsprit is to add 6 coats of spar varnish over the epoxy. I will do that over the next couple of weeks as I wait for my portlights to arrive. The backing plate was supposedly "improved" by my yard in 1995 during a year-long haulout. 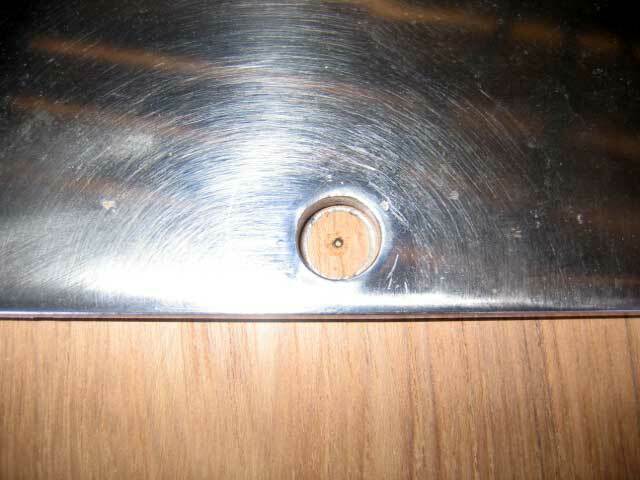 I asked them to replace the stainless backing plate with a thicker steel plate and add several layers of roving to the bow area just to beef it up. The next time I visited the yard the work was completed and everything freshly painted out. 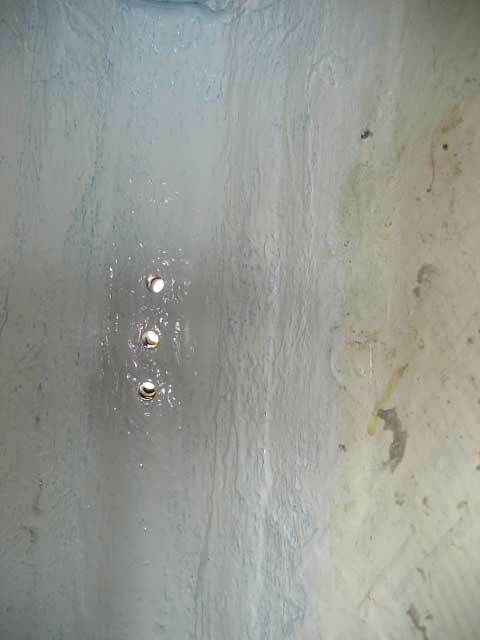 Only today as I was cleaning up the area preparing to fill the bolt holes with epoxy did I discover that the work they did had pulled loose from the hull, and had in fact allowed some amount of water to enter the boat. 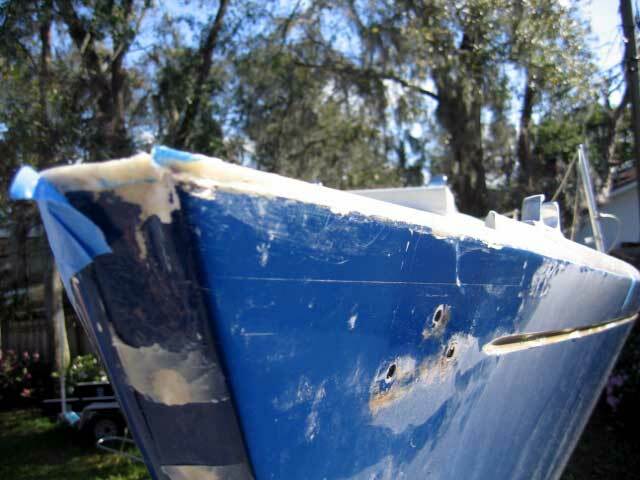 As I started exploring with a chisel and screw driver, it became clear that they had simply glassed over the painted surface of the inside of the hull, and used polyester instead of epoxy resin to boot. I literally pulled the whole mess out with my fingers. I'm sure there are yards out there that do meticulous work, but I haven't found any of them yet. 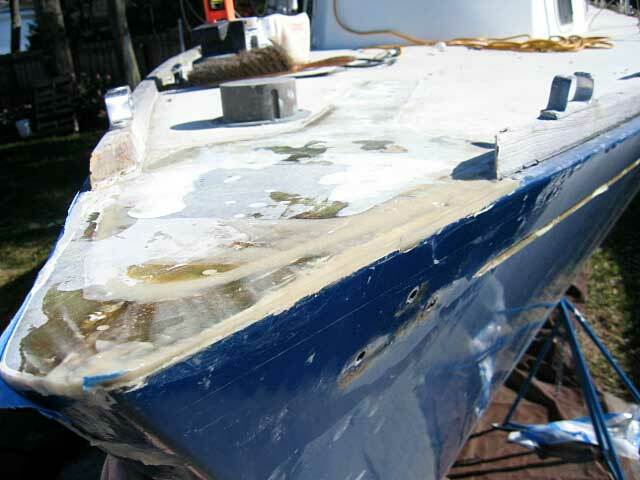 As for this sloppy work, I can only blame myself for not doing it right and asking strangers with no vested interest in my boat, her rig, or my life to work on such a critical area. I won't make that mistake again. To correct the problem I laminated together some scraps of teak in thickened epoxy and let it dry thoroughly. Then I used a caliper to take off the dimensions of the inside of the bow and transferred them to the teak and started shaping with a hand plane. 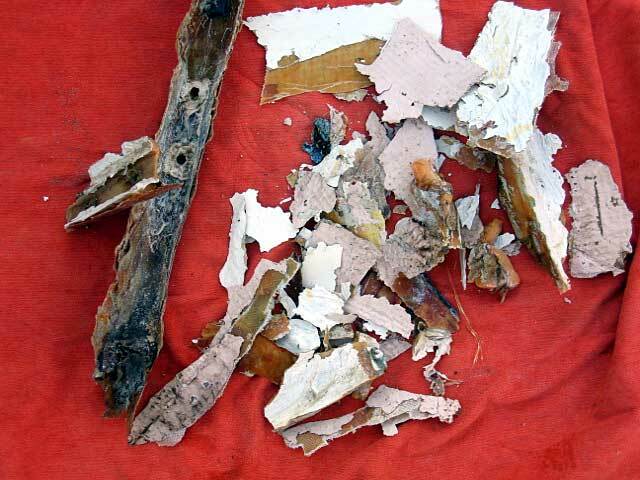 The photo shows the old roving "mold" that pulled away from the inside of the bow, and the shaped teak backing plate that replaces it. I will rough up the fiberglass and set the block in a load of thickened epoxy. Then drill the holes through the bow and the backing plate for the new chainplate fitting. 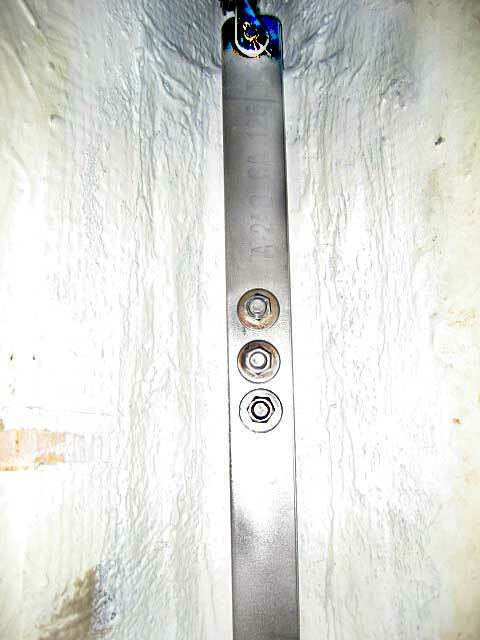 To complete the installation, I ordered plate stock stainless steel from McMaster 1/8" thick, by 1-1/2" wide by 12" long. I will shape this into a chainplate to tie the deck to the bobstay chainplate and act as a backing plate for the bobstay chainplate bolts as well. 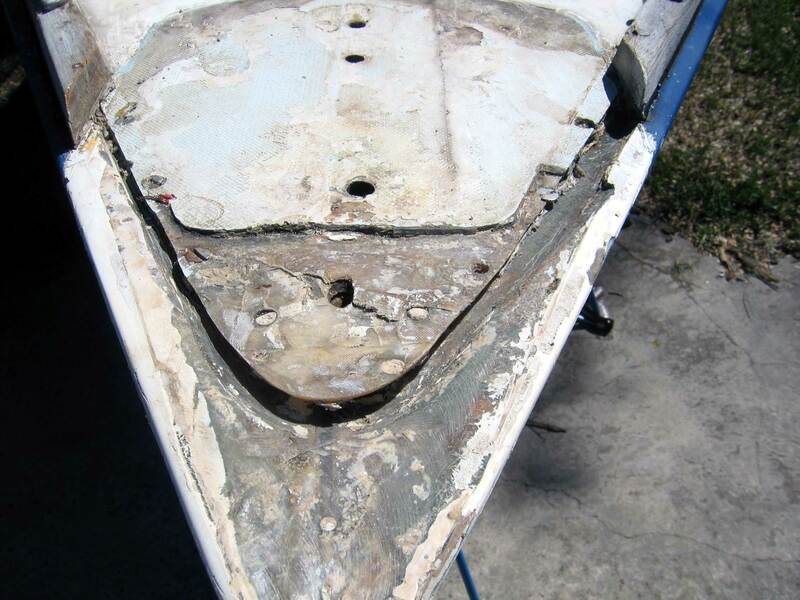 Because of the upward force of the inner forestay, it is a safety factor to connect the backing plate of the inner forestay chainplate to the hull, and in the case of the Bristol, it will connect to the backing plate for the bobstay chainplate. 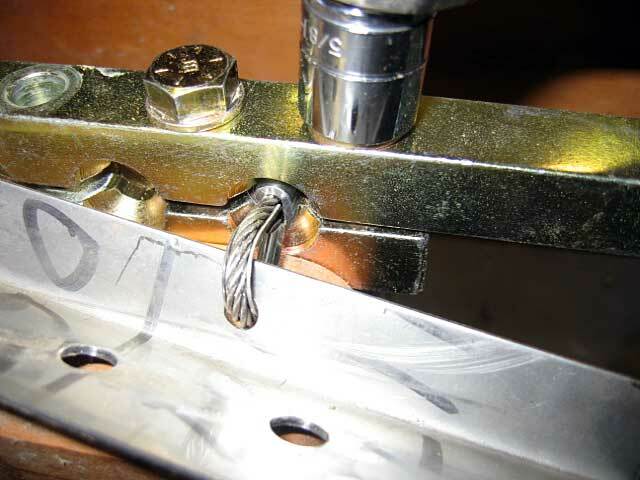 So as I wait for McMaster to ship the stainless steel stock that I will use to fashion the bobstay backing plate, I begin to cogitate about how to connect it with a turnbuckle to the backing plate for the inner forestay. Rummaging about in the garage produces some stainless angle plate that I had made at one time but never got around to using. The angle plate, originally intended to protect the oak bowsprit from chafe is 1-1/2 " wide on one side and 3/4" on the other. 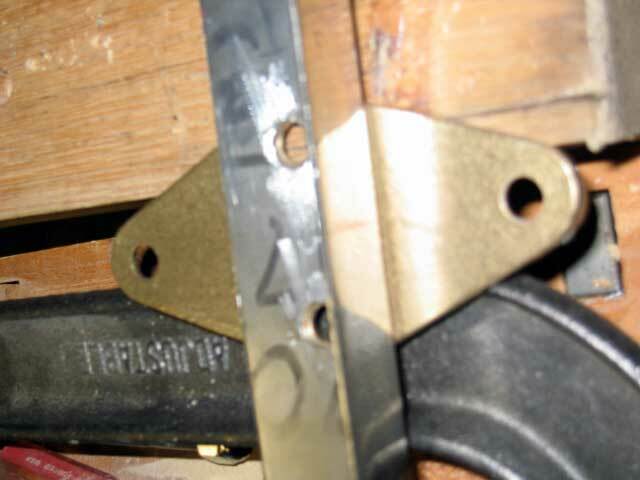 It will do perfectly well as a backing plate for two of the four through bolts of the inner forestay chainplate. 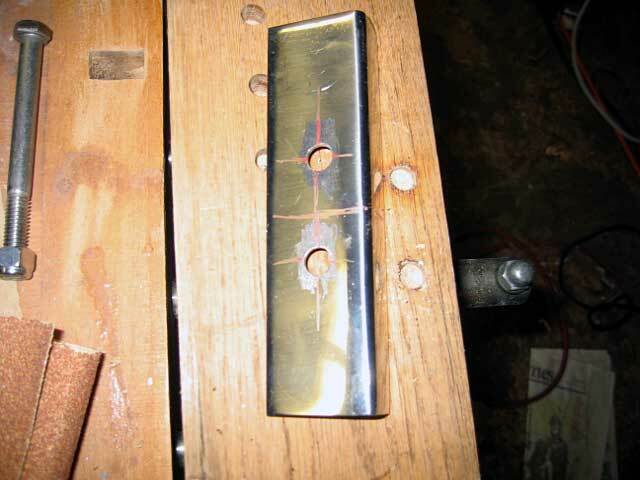 I mark it to align with the two cross holes of the chainplate and drill it. Tomorrow I will drill the angle in the center of the two holes. The angle with its single hole will point down, and I will swage a nicopressed wire around it, that will feed down about 12 inches to the top of a turnbuckle. 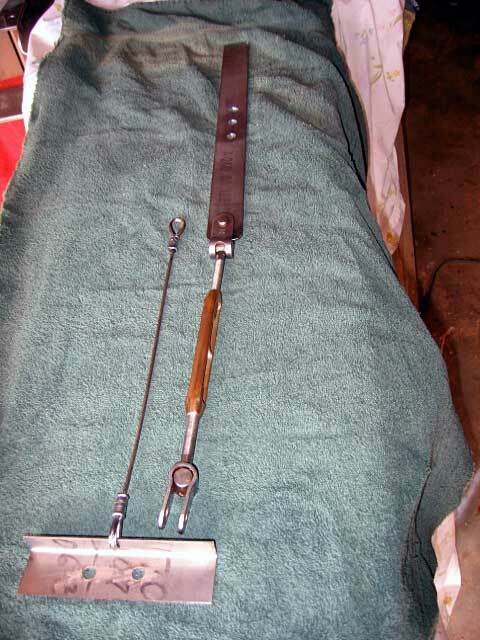 The other end of the turnbuckle will be pinned to a hole I will drill in the top of the plate stock from McMaster that will be the backing plate for the bobstay chainplate. 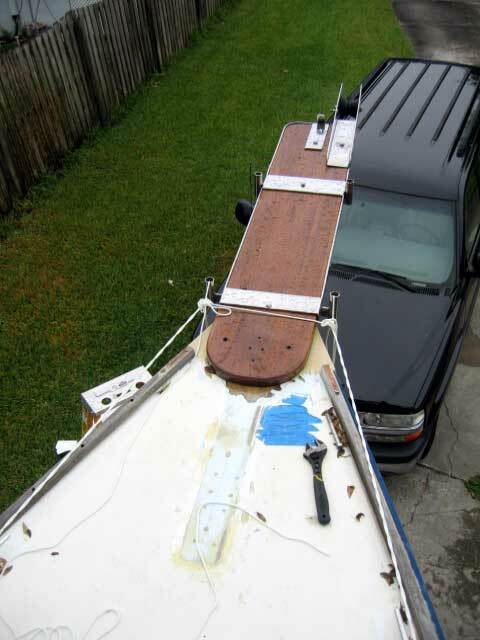 Then, all I have to do is tighten the turnbuckle to hold the deck down (not that I suspect it would lift up at all but it is a standard precaution when rigging an inner forestay). I drilled the angle for the wire connection to the turnbuckle. Then I inserted a 1/8" stainless thimble and the 1/8" wire around it and set up the Nico press zinc collar in the hand press. Eight-inch wire need three swages, which I gave the fitting. I will trim the wire and add the other thimble and eye when everything is assembled on the boat. Finally today I built a base of thickened epoxy to conform to the curve of the bobstay chainplate. 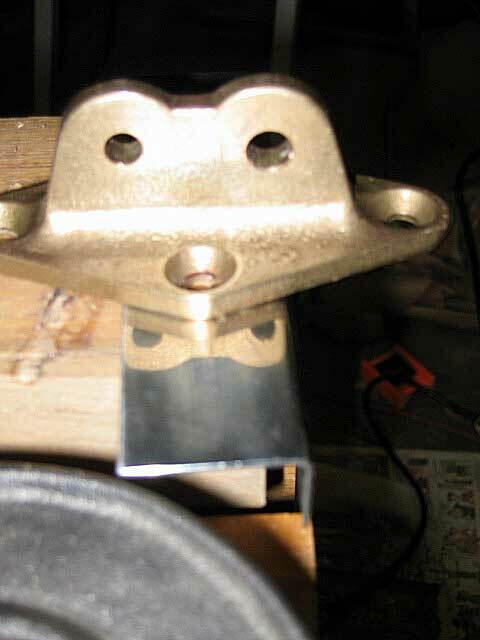 As you can see in the photo, the curve of the chainplate is slightly different than the curve of the bow. So, I taped around the chainplate base, thickened a small batch of epoxy, and laid it over the area. 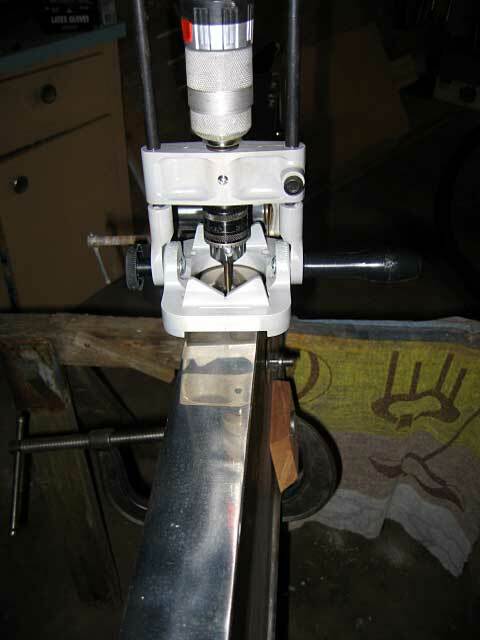 The I covered the epoxy with some wax paper, and pressed the base of the chainplate against the paper to create an exact impression of the curve of the base. I let the impression dry until the epoxy was in its sort of rubbery stage, and pulled off the wax paper and the masking tape. I will clean up the edges tomorrow. This evening after work I decided to install the bobstay backing block. First, in order to align it with the holes I drilled, I waxed the thru bolts carefully and inserted them into the holes. Then I mixed up a 5-pump batch of epoxy, painted the inside of the bow--I had already roughed it up with 40-grit sandpaper and washed it in acetone. 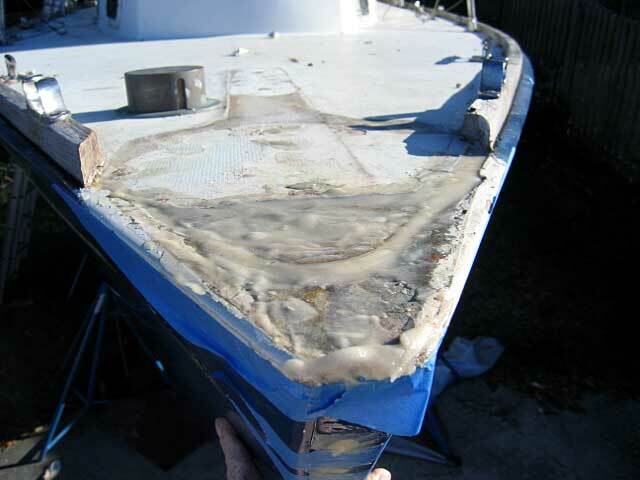 The boat was hot from being closed up all day; about 85 degrees inside and the thin epoxy began to set immediately. Then I thickened the rest to the consistency of peanut butter and added it to an empty caulking tube. I mixed up two more batches the same thickness and filled the tube. 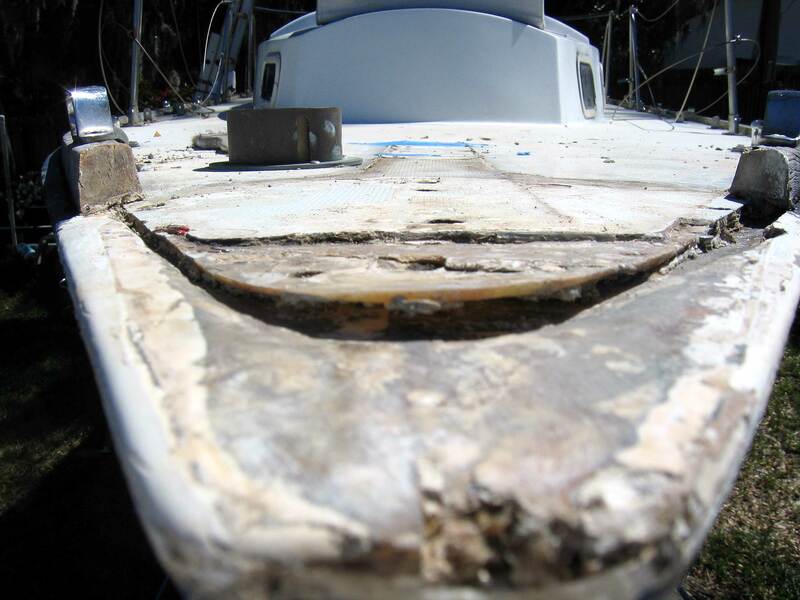 On the boat, I laid down about a two inch thick line of epoxy into the bow cavity and around the protruding bolts. 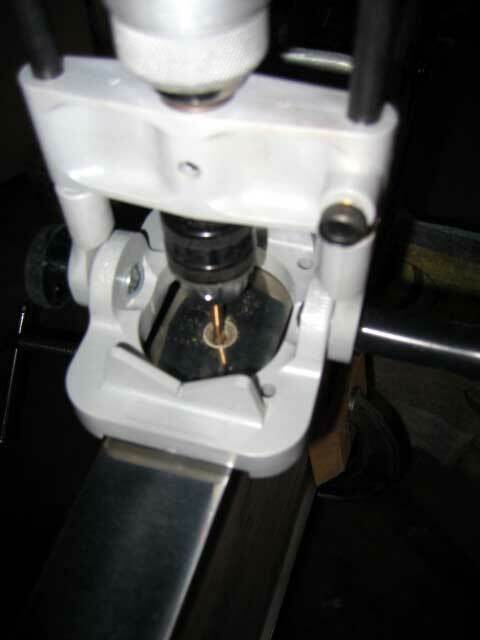 Then, I slipped the backing block down onto the bolts pressing it into the hot mixture. 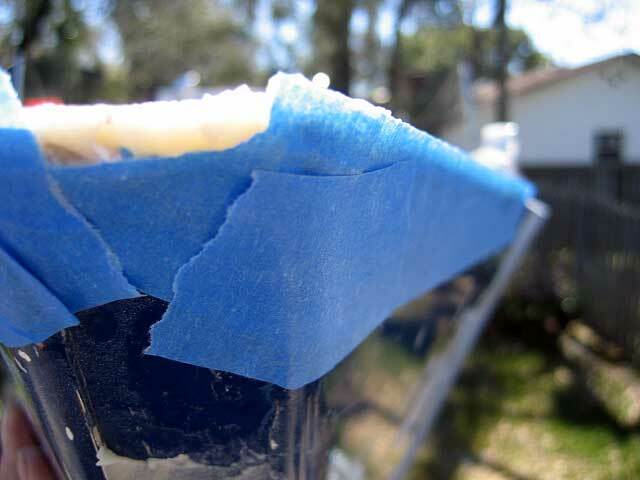 I caulked around the sides, filling up the space between the backing block and the sides of the hull. I used all the mixture and had to make up another two batches to complete the fillets. The epoxy started kicking immediately and I drove out the bolts from inside with a wooden dowel. I baby sat the mix with a spray bottle of water just in case it started to smoke, but it didn't. 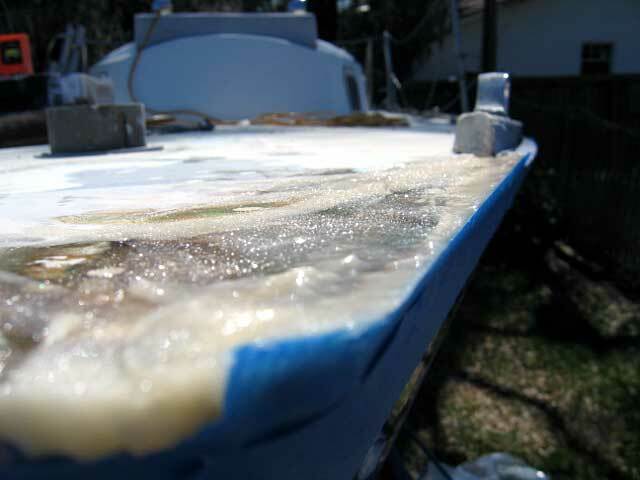 The coolness of the thick hull acted as a heat sink and pulled the heat away from the mix. In an hour it had started to cool and was hard. The following week I added two layers of 6 oz. cloth and two of 24 oz roving. With a coat of the System Three epoxy primer, I re-drilled the holes from the outside. Then I began work on the stainless backing plate. With the help of my brother John, we test mounted the new bowsprit. 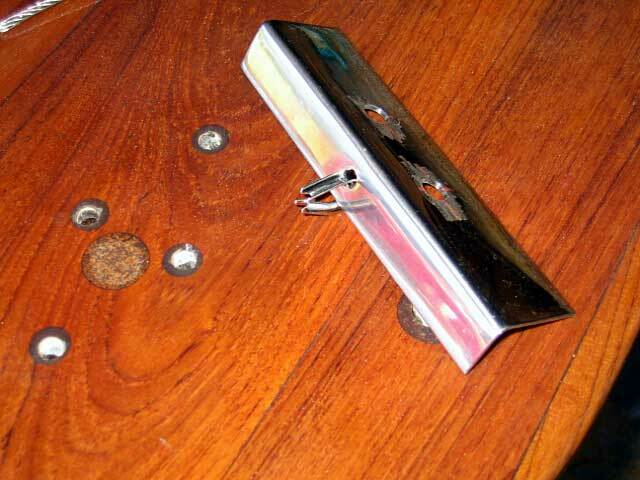 I used two simple Spanish windlasses to secure it and align it to the centerline of the deck. Then I drilled the center mounting hole thru the deck and backing plate. After the sprit was bolted in place, I drilled the two side mounting holes and the four holes for the inner forestay chainplate. I took it off the following day and taped over the holes. I still need to gouge out the deck core and fill them solid with epoxy, but aside from that small step, the new 50-year bowsprit is finished. Once I test fit the bowsprit, I finished adding epoxy coats to both sides (3 coats on each) and I added three coats of System Three LPU Clear Gloss with the cross linked hardener. I then mounted the bowsprit in the stainless surround and taped off the parameter so I could add two additional coats of the LPU clear mixed with nonskid grit. I used the same procedure as I used to add the non-skid to the top of the seahood. I used a small roller and rolled it on. It's easy to do and both very non-skid and very permanent. Here is the finished nonskid. It has a slight white appearance but more importantly it will keep me on the bowsprit. 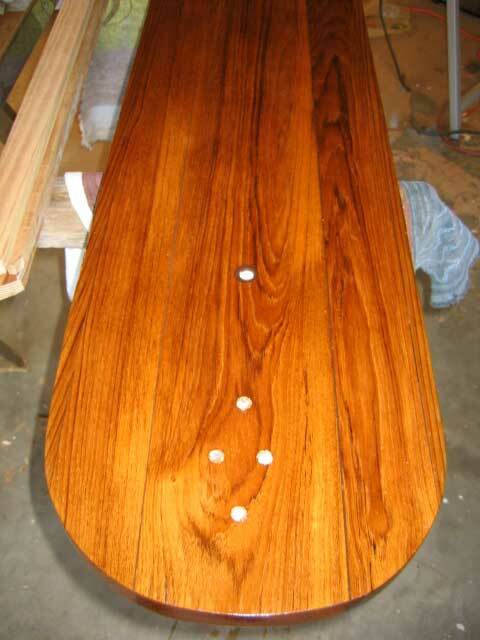 Here is the underside of the bowsprit--just as beautiful. 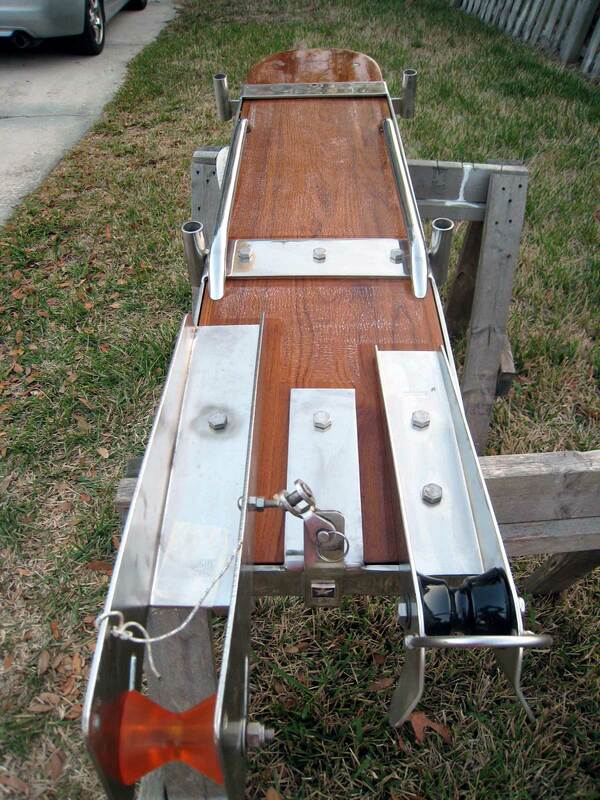 Here are features about the new bowsprit.